2. Rhys had a knack for disappearing into obscurity for long periods of time. In the media, she was referred to as dead several times before her actual passing in 1979. A literary adviser to the publishing house André Deutsch, having been told that the author had recently died in a sanatorium, in 1950 referred to her in an article as ‘the late Jean Rhys,’ while the BBC once declared that she had died during the war. 3. In the 1920s, while Rhys was staying in Paris, she had an amorous affair with the writer Ford Madox Ford. While the latter was already married to the painter Stella Bowen, he encouraged Rhys to keep writing. Their affair lasted for a year and a half, and possibly resulted in Rhys’ figuring as Lola Porter in Ford’s 1932 novel When the Wicked Man. 4. Rhys was born on August 24, 1890 in Roseau, Dominica, in the West Indies, where slavery was not abolished until 1834. After she openly advocated the rights of its black population and criticized its white ruling class, Rhys was popularly classed as ‘socialist Gwen’. 5. During her lifetime, Rhys had three husbands, two of whom eventually ended up in jail. In 1919, she married the journalist and songwriter Jean Lenglet, who was imprisoned in 1924 for illegal financial transactions. Her third husband, the solicitor Max Hamer, spent much of the time they were married in prison, probably for similar offences. In 1949, Rhys herself, who had by then become addicted to alcohol, was arrested for assaulting her neighbours. 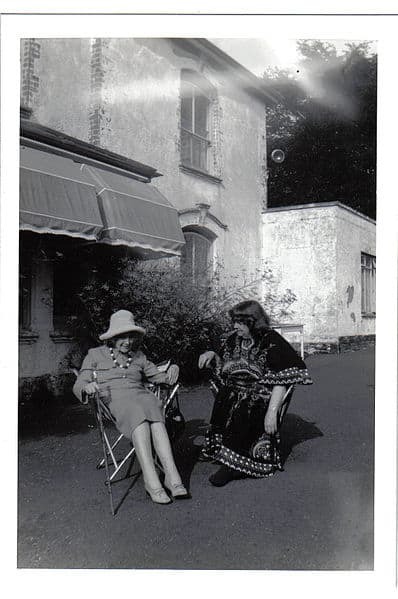 Image: Jean Rhys (left, in hat) with Mollie Stone, Velthams, 1970s, © 2009 G88keeper, share-alike licence. Why isn’t The Wide Sargasso Sea available in e-book? Thank you very much for pointing out those grammatical errors, Kanti. I corrected them, and hope that the post is more to your satisfaction now. Many thanks, too, for letting me know that men are people too; indeed, I had not realised this before, and am sure that my relations with my family and friends will much improve as a consequence. I’ll do my very best to set a better example in the future, so you can be assured that your comment has not been a waste of time, as your husband suggested. It’s been many years since I read “Wide Sargasso Sea,” but I remember being at once struck and inspired by the raw, visceral quality of the work. It left an indelible impression. Thanks for the post. Thanks for your kind review, and for reading the post! Great to hear you might re-read Wide Sargasso Sea! Great post. I loved Wide Sargasso Sea.